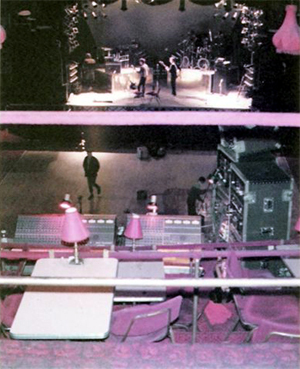 Soundcheck at the Cirque Royal, Brussels (3rd March 1983). 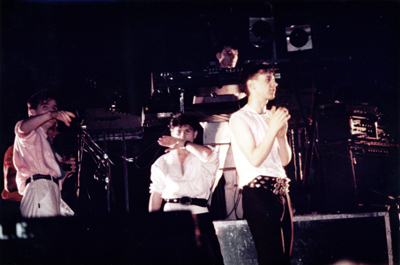 It was an extensive tour from the start: warm up in the UK (Glasgow, Edinburgh and London) followed by Japan, Australia, New Zealand and Canada before returning to the UK. 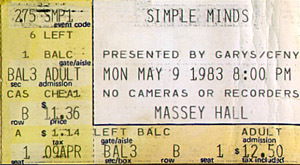 Plans for the Japanese visit were quickly shelved before the tour started, and the Canadian leg of the tour was marred by accidents and delays. 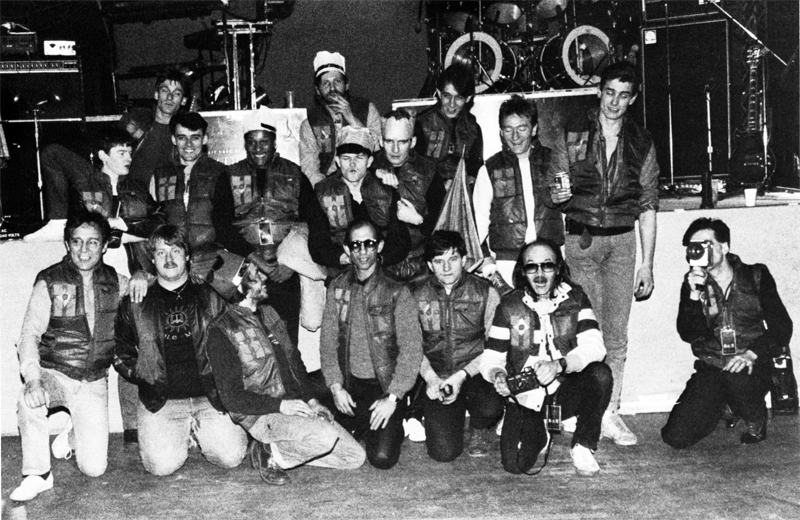 It all proved far too demanding for Mike Ogletree, who left immediately after the Canadian leg. 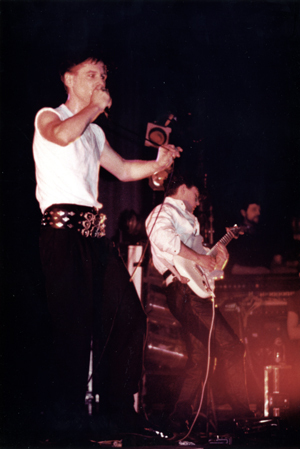 Therefore the band quickly contacted Mel Gaynor who joined them for the remaining UK dates. The second UK leg marked a significant ramp up in terms of merchandising and promotion. 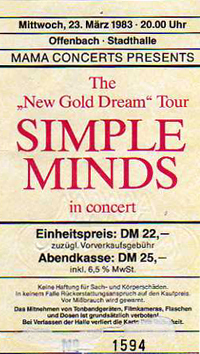 Whilst T-shirts and badges were for sale on previous tours, a tour programme appeared for the first time. 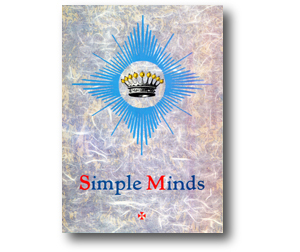 And the single Someone Somewhere (In Summertime) was issued to remind everyone that Simple Minds were back and touring. The band were clearly overflowing with ideas. 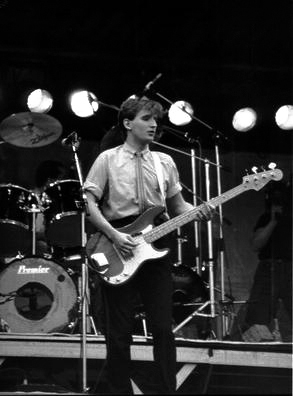 Not only did many of the songs take on extended, rearranged forms, but new songs, such as Street Hassle, The Kick Inside Of Me and, as a triumphal conclusion, Waterfront all started to appear; all of which would appear on the next album Sparkle In The Rain. 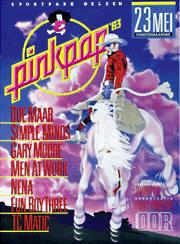 The band's first tour programme; a 14 page booklet packed with pictures, biographies, discography and more. 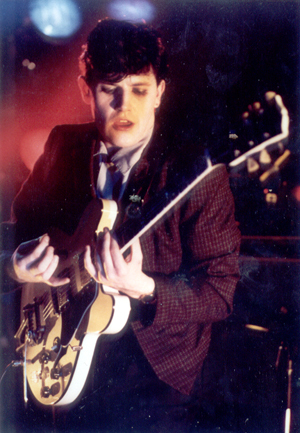 It was written by Adam Sweeting (who was writing the official biography of the band) and designed by Malcolm Garrett. 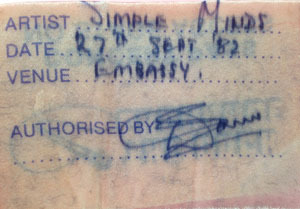 Total access pass for the entire tour. AAA pass for the French leg. AAA pass for the American dates. Backstage pass for the Italian concerts. And a slightly different version of the above. 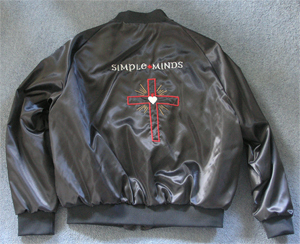 ...and band logo and cross on the back. 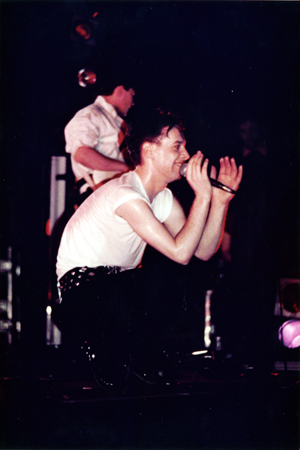 Part of the gig was recorded and broadcast by the Finnish Broadcast Company (YLE). 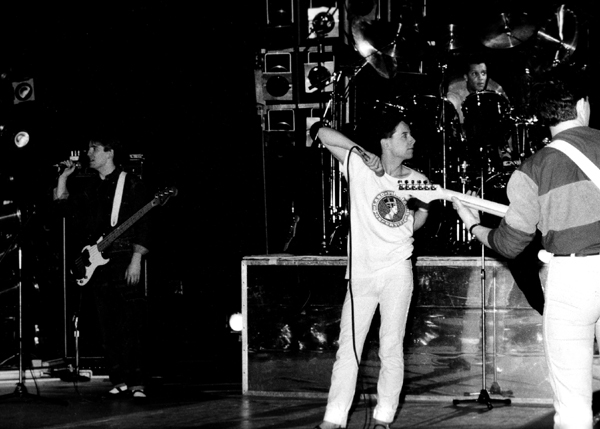 The tracks broadcast were: Colours Fly And Catherine Wheel, Glittering Prize, Someone Somewhere (In Summertime), Promised You A Miracle and The American. 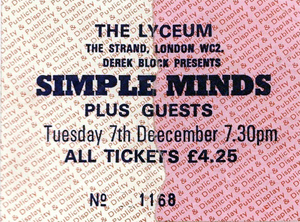 Thanks to Mike for the ticket and poster scan. 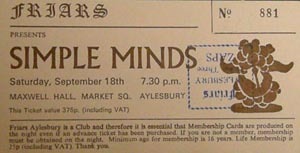 See Friars Aylesbury Online for more information about the gig. 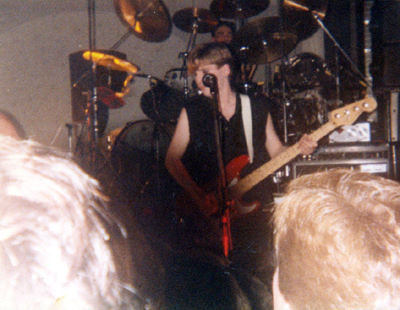 A recording of an unspecified concert from September exists in Mick MacNeil's archive. Taken from the mixing desk, the quality ranges from fair to good (and the tape has been unfortunately slightly chewed in places). Additionally the concert was recorded on two tapes so I Travel was prematurely faded out and Celebrate quickly faded in. 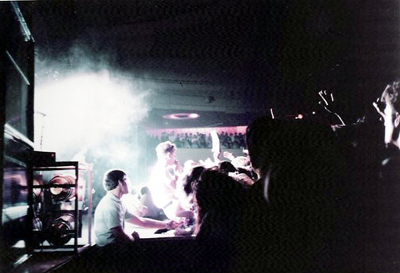 The recording features: 70 Cities As Love Brings The Fall, Colours Fly And Catherine Wheel, Hunter And The Hunted, Glittering Prize, Someone Somewhere (In Summertime), Sweat In Bullet, Promised You A Miracle, King Is White And In The Crowd, I Travel, Celebrate, The American, Big Sleep, Love Song and Room. Many thanks to Brad for the ticket scan. Many thanks to Mike for the poster picture. 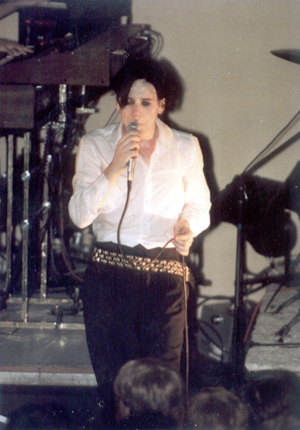 The gig was filmed and recorded for Italian TV. 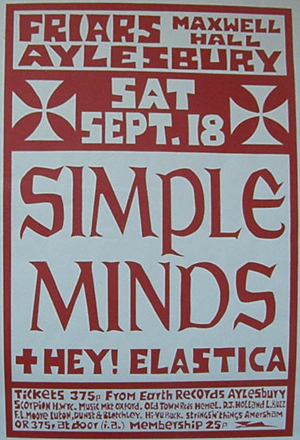 A complete copy of this gig appears in Mick MacNeil's archive. The quality is excellent (except for some hiss during the start of Love Song) and was taken directly from the mixing desk. 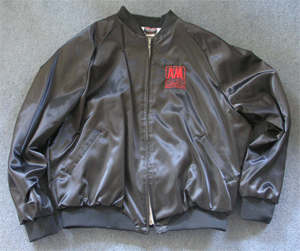 Virgin also have the complete gig in their vaults. The PA broke down halfway through the set. After the problems were fixed, the band ran through the whole set again. 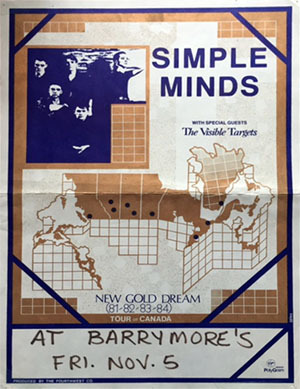 A complete copy of this gig appears in Mick MacNeil's archive. The quality is mostly excellent, although the mix isn't quite right for the first few tracks (the vocals and guitars dominate). 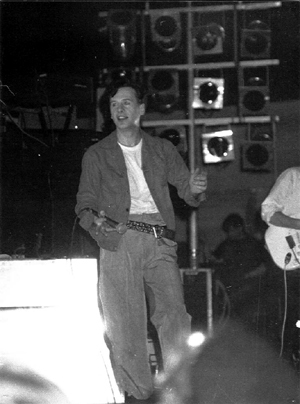 This gig was recorded by Pete Walsh for Virgin. Nothing has been offically released yet. 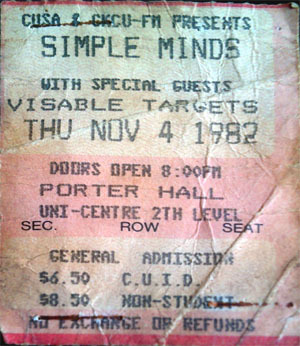 A complete copy of this gig appears in Mick MacNeil's archive. The quality is pretty good throughout except for King Is White And In The Crowd which fades in and struggles with the recording levels. This concert also appears in Mick MacNeil's archive and is almost a perfect recording - except for the unfortunate fade-out during Someone Somewhere (In Summertime). Thanks to Paul for the ticket scan. 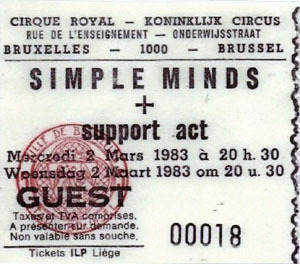 A complete copy of this gig exists in Mick MacNeil's archive. Slightly flat (due to the volume auto-level struggling with the drums and bass) it is, however, a good solid recording of the concert. 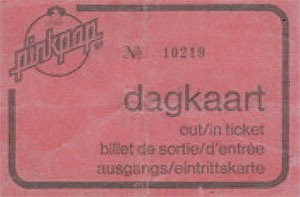 Many thanks to Putte for the ticket scan. Many thanks to Dan for the scan. 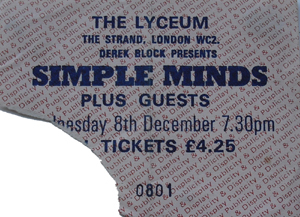 Simple Minds were the first act to play at this venue according to this press release. 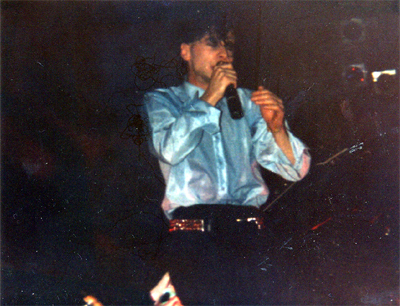 A recording of concert recorded in Dallas exists in Mick MacNeil's archive. Taken from the mixing desk, the quality ranges from fairly good to good. 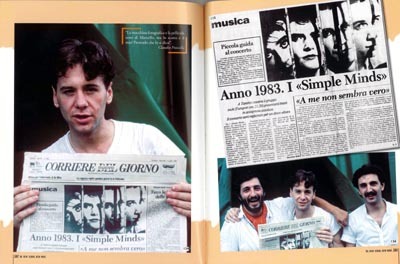 The recording features: Glittering Prize, King Is White And In The Crowd, I Travel, Celerate, The American, Colours Fly And Catherine Wheel, Hunter And The Hunted, Someone Somewhere (In Summertime), Big Sleep and a rare coupling of New Gold Dream (81,82,83,84) - Glory. It's possible that Promised You A Miracle was played but is missing from this recording. 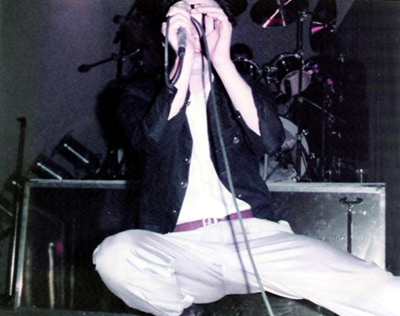 This gig was recorded and broadcast. 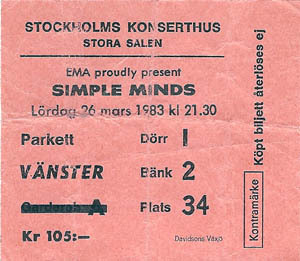 Many thanks to Paul for the pass and ticket scans. 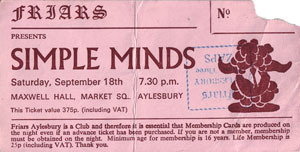 Many thanks to Paul for the flyer scan.
" There is a field in Belgium that lies silent and rain sodden for much of the year round. Otherwise it is fairly nondescript with no particular features to make it any different from the patchwork of brown and green earth that covers the surrounding countryside. This particular patch of ground is however more than a little special within the history Simple Minds. " " Situated 30 kilometers from Brussels, the aforementioned field borders a small village belonging to the municipality of Rotselaar. It is however annually transformed - rather incredibly so - out of its tranquil existence and into the site of the massive Rock Werchter Festival. For that reason, and thanks to the volume of accompanying memories and experiences - both distant and fresh - this site could almost be named by Simple Minds as our "Field Of Dreams. " " I remember with great clarity the first time we made the journey that takes you into the backstage entrance that is reserved for the festival's artists and organisers. 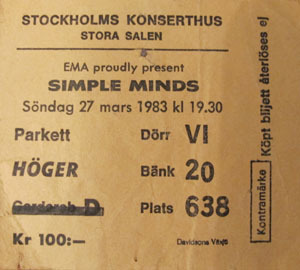 It was 1983 and Simple Minds had never played at any event that could hold an audience of upwards of 60,000. The previous day's gig in Tourhout (also Belgium) was in itself a daunting experience in terms of magnitude, but Werchter seemed altogether on a bigger scale. Despite the overnight confidence that had been instilled - we had gone down an absolute storm in Torhout, featuring on a bill alongside U2 and Peter Gabriel. Regardless, I felt so nervous on arrival at Werchter that I am sure I was shaking more than the small leaves that covered the trees marking the perimeter of the festival site. " " Ah, but at least the breeze kept us cool as we awaited our appointed performance time. It also offered some respite from the soaring heat of that entire weekend. To be honest, I felt afterwards that as glorious as our Werchter debut may have been, we had played as if our lives depended on it and again were met with a sensational reaction after all. But we had not quite reached the performance level of the previous day in Torhout in my opinion. Perhaps we had given too much of ourselves there? Likewise, perhaps performing in intense heat, then staying up all night afterwards, had taken too much out of me in particular. But hey, we celebrated afterwards in the bar of the Sheraton Brussels, all the same. For having now "delivered" in front of two huge audiences, we were convinced that our music was more than able to succeed at any kind of live event, no matter the scale. What was there not to celebrate in that? Werchter had been great to us after all, beyond our dreams in truth. " 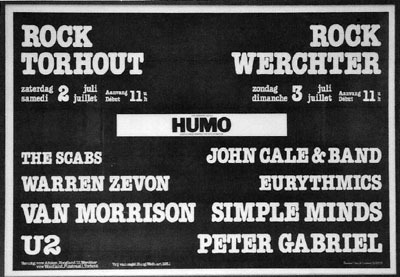 " Only 12 months later we returned to the same site, this time we were to fulfill the headlining role on a Werchter bill that featured our idol, (no other word for it) Lou Reed. 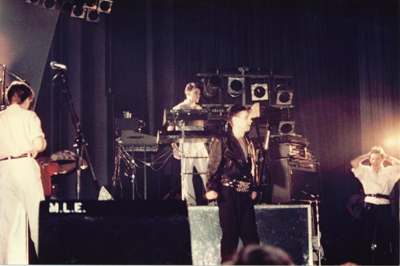 By that time we were feeling very comfortable performing in front of huge festival audiences, and to many onlookers it was obvious that Simple Minds had grown so much in stature since our performances of the previous summer. Waterfront had recently become our signature intro song, and if ever a tune was designed for the festival situation, this was surely it. " 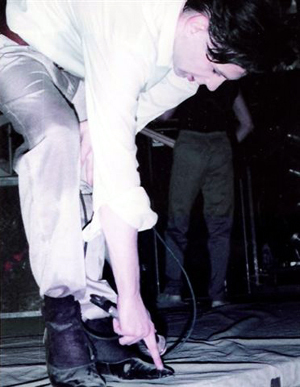 " The chance to headline the festival for a second time came only two years later, following a period of 24 months that had seen our band become known the world over. While that may have been so, we never forgot the fact that it was Werchter that gave us the chance to launch ourselves on the bigger scale as a live act. Even currently we still feel humbled by the opportunity and encouragement that the audience at Werchter, and indeed promoter Herman Schueremans gave us back in those formative days. " " Since then and by my estimation, we have played in one form or another at Werchter a further 4 times, making it seven in total. Amazingly that number is due to increase the weekend after next when we return for an eighth performance, and where none other than The Rolling Stones themselves will be headlining the festival. " " If you had told me as teenager in Glasgow, walking to school with my Rolling Stones albums under my arms, that our little band would one day have the chance to play alongside the Stones, as we have already done on two occasions, I would have told you that you were an bigger dreamer than me. 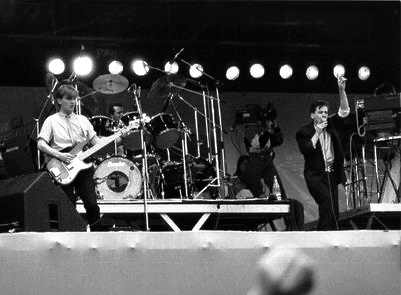 Likewise, if you had told me backstage at Werchter in '83, that over 30 years later we would be preparing to once again walk on with nothing but our music, our energy, and our desire to entertain and uplift 60,000 plus people. I would have been dumbfounded as to how i could be possible? " 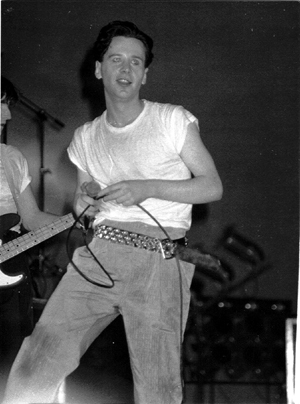 A complete copy of this gig appears in Mick MacNeil's archive. The quality is fairly good boarding on good. Despite being a soundboard recording, it suffers from volume and distortion (especially at low frequencies). Thanks to Francesco for the ticket scan.
" Most groups can usually recall specific gigs that for some reason of importance were "career defining" or "career changing" for them. In our case there are quite a few, notwithstanding our first ever gig of course. After all, it is said that every journey begins with a first step. 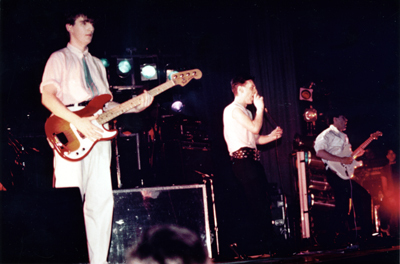 However a few gigs, due to consequences; perhaps mysterious and therefore unforeseen, actually became "life changing" as a result of them having taken place. 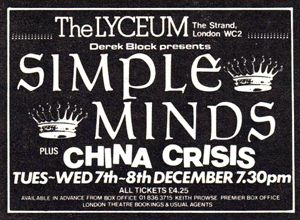 And well, next month marks for me the anniversary of one of those gigs in particular. " 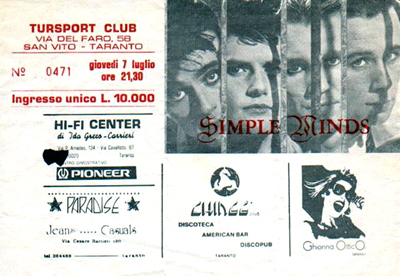 " The show I refer to took place almost 30 years ago in a smallish, outdoors sports arena, situated near the harbor front at the port of Messina. It was to be my first night in Sicily, a place that at no time prior had I given much thought to, or at least so out with the context of Francis Ford Coppola�s award winning Godfather movies. 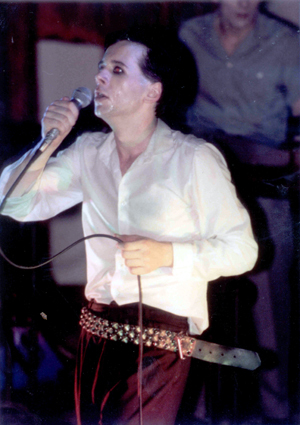 But lo and behold; some kind of magical seduction seemingly took over me when I set foot in Sicily for that first time, and as some might already know, a whole three decades later and as a result of that first gig, I am still there. 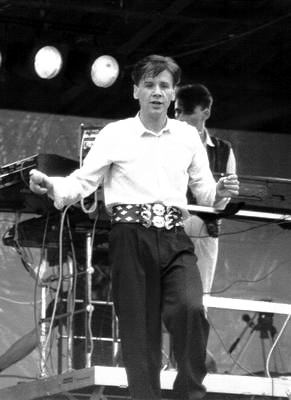 (Or at least I am still there very often when not on concert tours, or writing and recording with Simple Minds and Lostboy! AKA.) "
" I don�t have a place that I call home and it has been that way for a decent amount of time. The main reason I have no home is that I don�t spend enough time in one specific place for me to feel like it is really my home. Sentimentally speaking, Scotland of course will always be "home" for me. It is where I grew up, is to where I will always feel that I belong. I am quite sure of that, but the reality is that for most of my grown up life I have not lived there enough for it to be my home as I am neither based or work from there. " " All of which brings me back to Sicily, because in the absence of having any real physical home, Sicily has been a kind of on-off sanctuary for me, it is quite definitely my spiritual home and continues to be so even decades later. Or it is as long as we agree that the definition of "spiritual home" is: A place where you feel you belong, although you were not born there, because you have a lot in common with the people, the culture, the landscape and the way of life. " 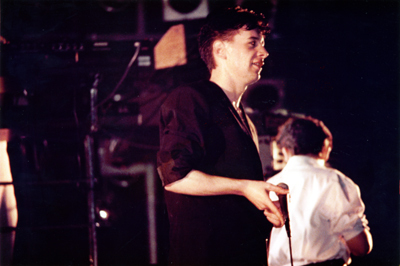 " And what was it about the gig in Messina all those years ago that influenced such an outcome that led to Sicily getting under my skin and into my heart? Well, I could write a book on what happened during my first 48 hours in Sicily. I could explain how Taormina floored me with its charms in a way no place has done quite since. (Kyoto in spring comes close though.) I could also hint at many other things that came to pass in a couple of days that then led me to make my base within striking distance of Mount Etna. But much of that would be way too intimate, relevant only to me for the most part. " 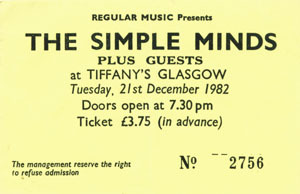 Simple Minds were considered for gig, but decided against it, as they wanted to start work on Sparkle In The Rain. It is possible that they were mentioned in press releases and advertising. 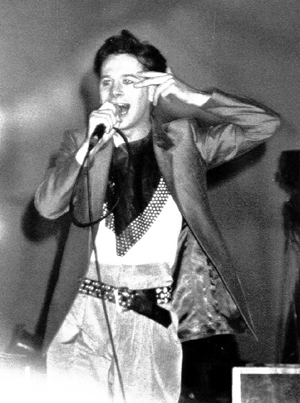 Street Hassle, I Travel, Love Song and The Kick Inside Of Me are also sometimes included on various listings but the band didn't play them.